NEW – A comprehensive guide to help men discern if God is calling them to religious life. Written by Fr. Benedict Croell, O.P. and Fr. Andrew Hofer. O.P. 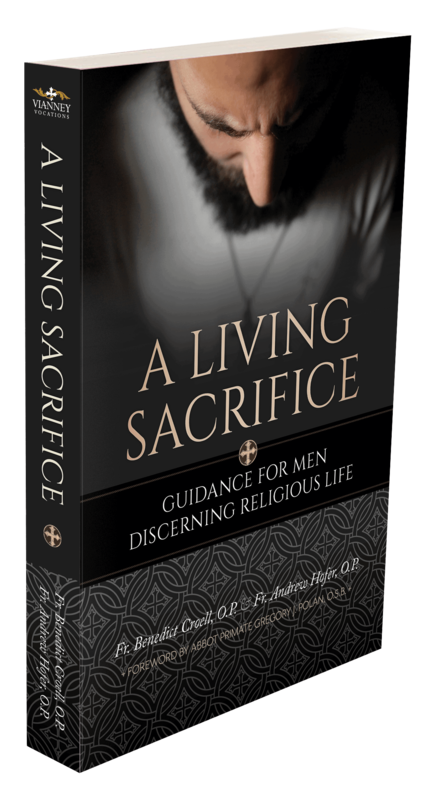 A Living Sacrifice is a comprehensive guide for men who are discerning God's call. It serves as both an introduction to religious life as well as a guide for discerning vows of poverty, chastity, and obedience. With clear language, engaging examples, and solid theology, the book tackles the big questions: "Should I date while discerning?" "Should I be a diocesan priest or a religious brother?" "What community should I join?" "What should I expect during formation?" "What is religious life anyway?" and "How do I know for sure if I'm being called?" A Living Sacrifice offers a solid alternative to "cyber discernment" by addressing men's most common questions in a single volume. Perfect to bring into the chapel to spark a heart-to-heart conversation with Christ. Co-author Fr. Benedict Croell has been called the most successful religious vocation director in America, with over 100 men entering his community during his time of service. (He is now assigned to The Angelicum in Rome.) Co-author Fr. Andrew Hofer oversaw the initial formation of new brothers, and offers both real-life insights and a solid theological foundation. Together, they amass their considerable experience to provide reliable advice during every stage of vocational discernment. 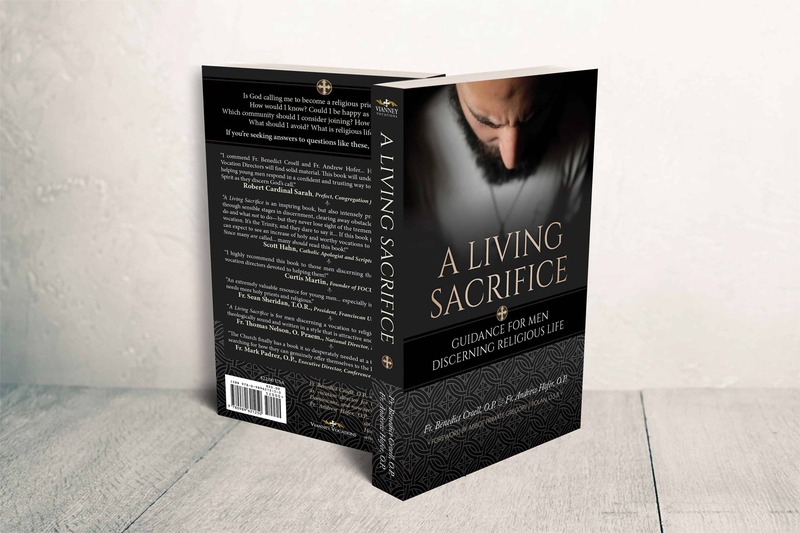 Importantly, A Living Sacrifice includes an overview of most forms of religious life in the U.S., as well as contributions from priests and brothers in many different communities, such as the Franciscans, Jesuits, Holy Cross, Norbertines, and many more. 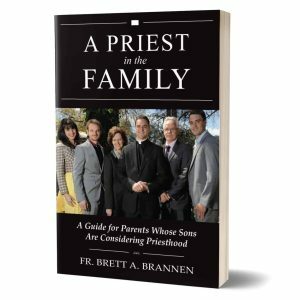 While authored by Dominican priests, the book is deliberately written for men discerning any religious community. Foreword by Abbot Primate Gregory J. Polan, O.S.B. Nihil Obstat, Rev. Basil Cole, O.P. Imprimatur, Rev. Msgr. Charles V. Antonicelli, V.G. "A Living Sacrifice is an inspiring book, but it is also intensely practical. The authors lead us through sensible stages in discernment, clearing away obstacles and distractions -- what to do and what not to do -- but they never lose sight of the tremendous mystery at the heart of vocation. It’s the Trinity, and they dare to say it. Nothing is more profound and essential to life than this encounter. You’ll feel that on every page of this book. And if this gets out into the right hands, we can expect to see an increase of holy and worthy vocations to the religious life worldwide. Since many are called... many should read this book!" "FOCUS works with many young men, some of whom have heard the calling to enter the fraternity of religious life. 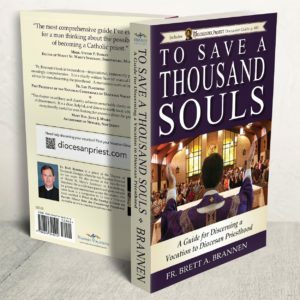 A Living Sacrifice is the fruit of lives lived discerning the will of God, and especially in this noisy world, I highly recommend this book to those men discerning the religious life, and to those vocation directors devoted to helping them!" "As a former Vocation Director I wish I had this book to offer men who were discerning their vocation. It is a clear and practical guide for any young man discerning God’s will. Also, it is a wonderful resource for vocation directors or anyone who promotes vocations to the priesthood and religious life. No doubt Fathers Benedict and Andrew are offering realistic advice based on their years of prayerful experience ministering to young men called to serve the Lord. The Church finally has a book it so desperately needed at a time so many young men are searching how they can genuinely offer themselves to the Lord." 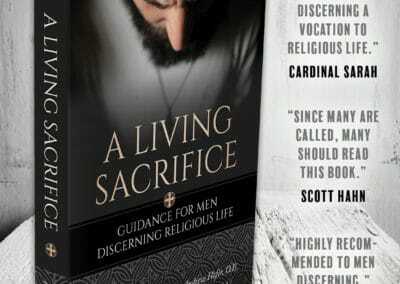 "A Living Sacrifice is a very practical book for men discerning a vocation to religious life in all its forms. It is theologically sound and written in a style that is attractive and easily understood. Not only does it help young men in their inner search for a possible vocation to the religious life; it also gives them practical counsel on how to find the right community for them. I highly recommend this book for all young men who are searching for God's will in their life." Fr. Thomas Nelson, O. Praem. "I have heard it said that the problem of being 'a living sacrifice' is that when things get uncomfortable, one can crawl off the altar. The Church has needed a book for men discerning religious life for a long time. Fr. Croell and Fr. Hofer have provided this excellent resource covering all the bases! 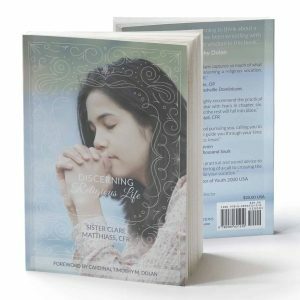 Their experience in living religious life and guiding others rings loud and clear in these easy-to-read and practical pages. Religious life is the most perfect form of life; the offering of oneself in a holocaust to Jesus. This book will contribute to the renewal of religious life in the Church!" "In every generation, the Lord calls some men to follow him in radical ways, even to share intimately in His own way of life, poor, chaste and obedient. If the Lord is calling you to this privileged life of belonging totally to him, then this book will give you the foundational principles and real-life examples to help you respond with generosity and trust." "Spiritually sound and eminently practical, A Living Sacrifice is a rare find that will inspire men who desire to give the totality of their lives to God with generosity and courage through the profession of the evangelical counsels. The world today needs zealous, faithful religious, and this book offers us hope that God is indeed still calling!" "Every year my wife and I host several dinners for students discerning about a religious vocation. I always feel a little inadequate, having myself chosen another path in life. In the Dominican spirit, A Living Sacrifice offers straightforward and accessible responses to many of the questions I can’t answer. Balancing practical information, personal narrative, and Catholic tradition, Fr. Benedict and Fr. Andrew have compiled an excellent resource for men at all stages of discernment." "In prayerful Dominican fashion, these pages are filled with indispensable advice on realizing one's vocation in Christ that is at once sensible and sanctifying. Religious life must always be discerned in community and this book brings its readers into contact with not only the figures and theologies of religious life's earliest beginnings, but also with all the lived realities of the 21st century." "Like the authors of A Living Sacrifice, I was helped by Benedictine monks in my priestly vocation. The world needs more monks, canons, friars, and other religious. This book will be of great service to a young man discerning a calling to religious life." "As Vocation Director for my Dominican Community, I have been blessed to work beside such great Dominicans as the authors of this book. A simple glance at its table of contents compels one not only to read this but to spread its message to the ends of the earth as it is sorely needed due to the lack of the presence of Religious men and women in so many areas. Christ promised to be with us until the end of time and a portion of his fulfillment lies within the hearts of youth who are being called to Priesthood and Religious Life. But young people need assistance in discovering this precious call. A Living Sacrifice proclaims the reality of the vowed consecration, a reality explained through a myriad of insights—in ways so practical, spiritual and inspirational that one experiences sitting at the foot of the masters and drinking from the springs which have nourished saints through the ages. Above all, this treasure trove gives a precious glimpse into the Joy of such a vocation to Religious Life….a particular Joy that radiates throughout the entire world from age to age!" 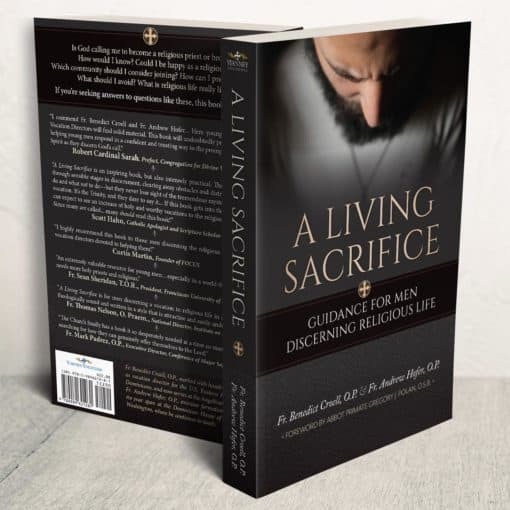 "Sensitively written, its deep theological insights wrapped in accessible prose, A Living Sacrifice offers solid practical guidance for Catholic men discerning religious life. The authors draw wisdom from Fathers and Doctors of the Church, especially St. Thomas Aquinas, as well as recent Magisterial teachings. Expertly avoiding the twin pitfalls of overpsychologizing and overspiritualizing, they provide a candid account of the joys and challenges of living out the vows of poverty, chastity, and obedience." "As parents who pray that our children will be docile to the prompting of the Holy Spirit, wherever it leads them, we could not be more grateful to Fr. Hofer and Fr. 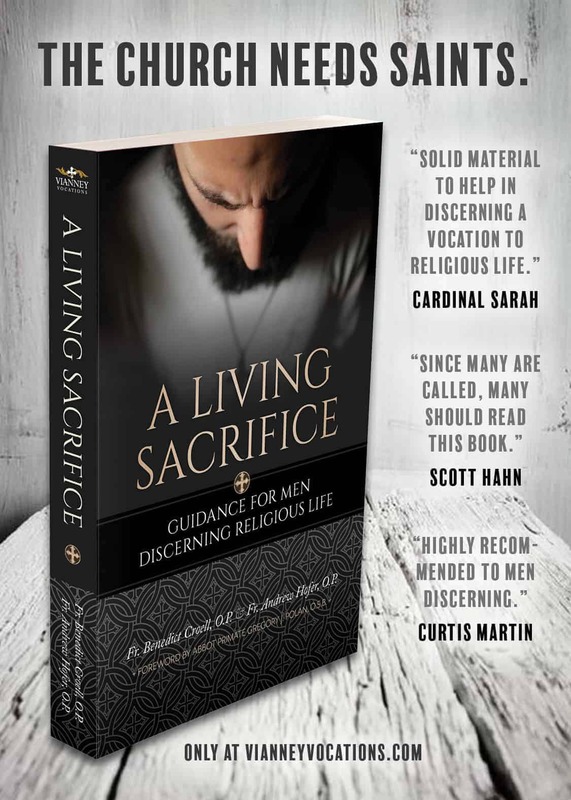 Croell for A Living Sacrifice: Guidance for Men Discerning Religious Life. At points deeply theoretical and tremendously practical, this book is a tour de force on men’s religious life. The reader will find tips for discernment, counsel for thinking about and conducting oneself during a visit, as well as the trials and temptations which await one after entering a community. Clearly, these authors speak from a wealth of experience. In addition, the Church’s teaching on religious life—as an eschatological sign of the Kingdom—comes across with beautiful clarity, as well as a treatment of essential Christian virtues, with a particular emphasis on their application to an aspiring religious (e.g., faith, hope, charity, and prudence). Along with this tremendous theoretical and practical instruction, the reader is exposed to a dazzling array of men’s religious orders, their histories and distinct charisms. If this weren’t already exhaustive, the book is punctuated by concise, practical tips from both saints and contemporary religious. In this work, the Church explains herself and speaks with the wisdom of the ages, both past and present. Any young man (or anybody helping young men discern and commit to a vocation) will find this book indispensable. What a gift to the Church!" Foreword by Abbot Primate Gregory Polan, O.S.B. Among his assignments, Father Benedict Croell, O.P., served as novice master for four years in Kenya and as vocation director for eight years for the Dominican Province of St. Joseph in Washington, DC. He presently heads the development and mission advancement office at the Pontifical University of St. Thomas Aquinas—the Angelicum in Rome. 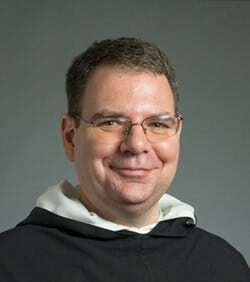 Among his assignments, Father Andrew Hofer, O.P., served in formation for eight years at the Dominican House of Studies in Washington, DC, after earning his doctorate in theology (specializing in patristics) from the University of Notre Dame. He continues to teach on the Pontifical Faculty at the Dominican House of Studies. WASHINGTON, DC, APRIL 4, 2019 - When Fr. 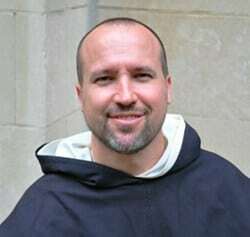 Benedict Croell was vocation director for the Eastern Dominican Province of St. Joseph, over one hundred men entered his province in just eight years. By any measure, that is a phenomenal figure. 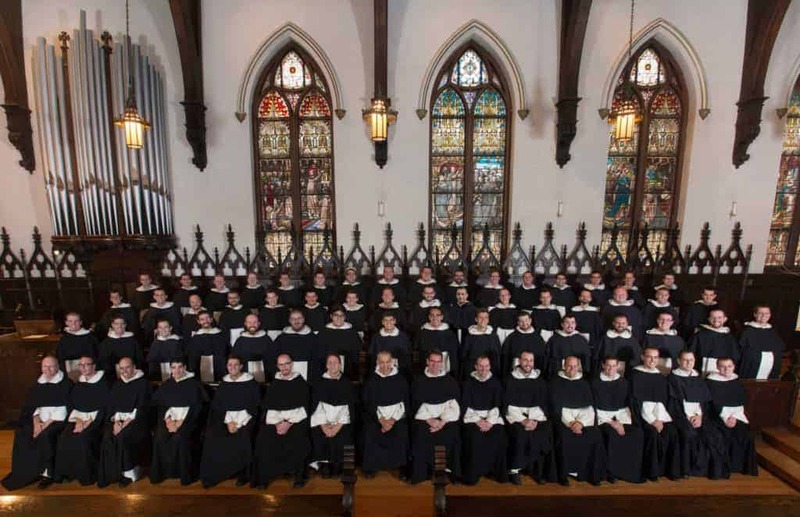 In some years, the Dominicans had more men entering formation than some of the largest archdioceses in America. Fr. Benedict Croell has teamed up with Fr. 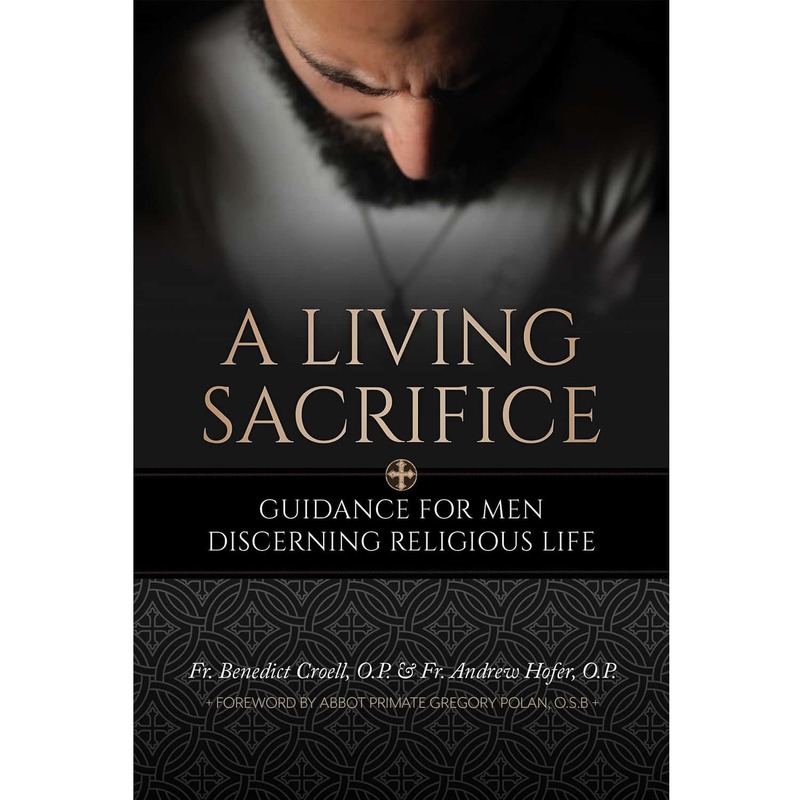 Andrew Hofer, who oversaw formation at the Dominican House of Studies in Washington, DC, to author a new book, A Living Sacrifice: Guidance for Men Discerning Religious Life. Such a book is much-needed, given the state of men’s religious life in the United States. In the past fifty years, the number of religious brothers and priests has declined by more than half, from about 33,000 in 1970 to about 15,000 today. Working with hundreds of men from various backgrounds gave Fr. Benedict a unique perspective. Over time, he began to see patterns—healthy and unhealthy—in how men approached their vocations. “Maybe I didn’t see it all, but I feel like I did,” laughed Fr. Benedict. It was this broad range of experience that led to A Living Sacrifice, which offers a clear pathway for men who may be confused about their call. 2017-18 Dominican Student Brothers & Formators, Washington, DC. The Dominicans were blessed with many vocations during Fr. Benedict Croell’s time as Vocation Director. After first vows, they came to Washington where Father Andrew Hofer oversaw their student years of formation at the Dominican House of Studies. A Living Sacrifice is a compendium of the real-life advice that Fr. Benedict and Fr. Andrew gave young men in their college and young adult years. With clear language, engaging examples, and solid theology, the book tackles big questions about chastity, how to know if you’re called, which community to join, what religious life is really like, and a host of other topics.